It’s nearly Pancake Day and I’ve really been enjoying testing out new pancake recipe ideas in preparation, if you haven’t already, check out my Oreo Pancakes with Raspberries & Creme Fraiche recipe from last week. Nutella is amazing stuff, but it has been getting a bad rep recently due to the high sugar levels and the fact it contains palm oil. I can’t say I’ll never eat or bake with it again, but it’s certainly made me more aware of what’s in it. I was so impressed with how good this homemade ‘nutella’ tasted! 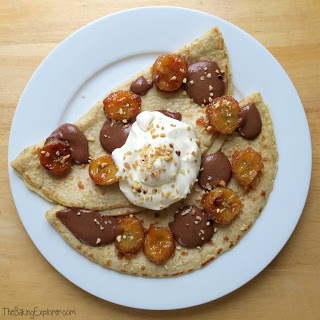 I’ll definitely make it again, and it tasted great with these pancakes and caramelised bananas! 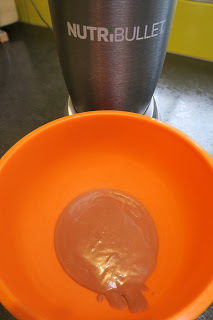 I started by making the nutella style sauce. The amount makes enough for two servings, so feel free to double or triple it depending on how many people you’re cooking pancakes for. In my NutriBullet I blitzed together 50g hazelnuts, 2 tbsp maple syrup, 3 tbsp almond milk and 1 tbsp cocoa powder until smooth. To caramelise the bananas I put 75g caster sugar in a frying pan and when it started to melt I added 2 sliced up bananas. When the caramel went golden, I flipped the slices over to cover both sides in the caramel, then turned off the heat while I made the pancakes. 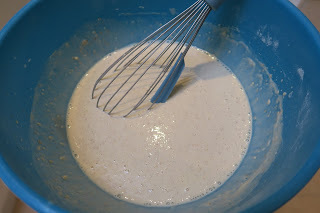 For the pancake batter I whisked together 50g wholemeal plain flour, 235g plain flour, 2 eggs and 570ml almond milk using my Joseph Joseph Whiskle, which is a 2 in 1 whisk with a bowl scraper attached. 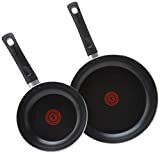 I heated up a frying pan on a medium heat and put a little butter in to grease it, then added the batter using a ladle to measure it out. I cooked on both sides until golden brown. 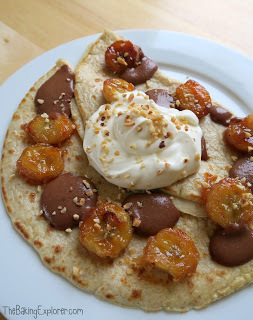 To serve the pancakes I folded them in half, added some of the caramelised bananas and dollops of the Nutella style sauce, then a big blob of creme fraiche (I used a half fat version) in the middle and then sprinkled over some chopped toasted hazelnuts to finish. 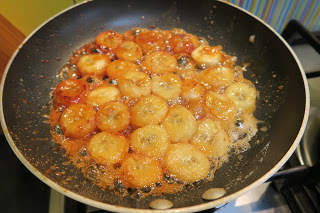 I’d never had caramelised bananas before and they were absolutely delicious! Mixed with the sweet chocolate sauce, crunchy hazelnuts and creamy creme fraiche they were the perfect topping for these pancakes. 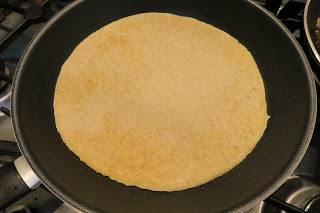 We had this for breakfast on a weekend and it was quick and easy to make, with such a satisfying result! NB. I was sent both the NutriBullet and the Joseph Joseph Whiskle for free, all opinions are my own. These look amazing! Thanks so much for sharing at Sunday Fitness & Food!! 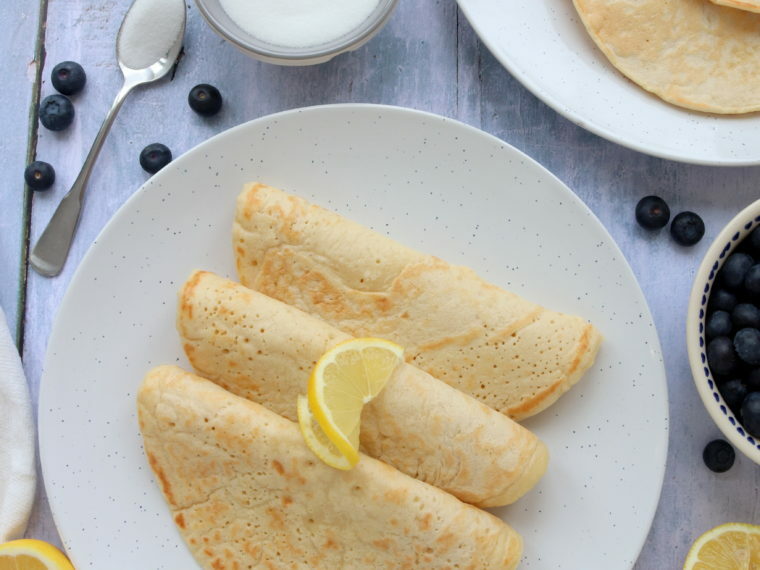 these pancakes look amazing ! They are so tasty I can't believe I've never had them before!